WOW clubs in TS Schools for Awareness raising on sustainable solid waste management among School students for achieving Swachh Hyderabad. 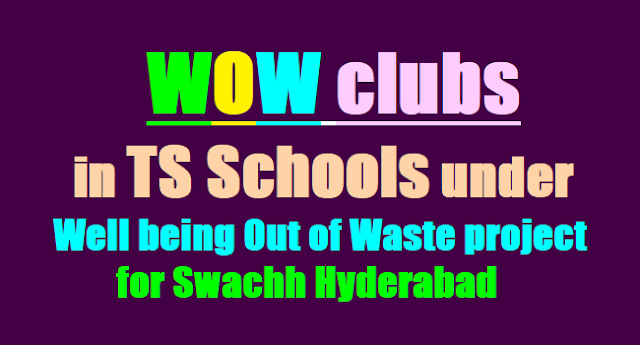 WOW program, WOW clubs in TS Schools under Well being Out of Waste project. Awareness raising on sustainable solid waste management among School students for achieving Swachh Hyderabad through formation of WOW clubs in 2000 schools under WELLBEING OUT WASTE (WOW) project, a joint initiative of GHMC- ITC and MARI. Sub: School Education - Awareness raising on sustainable solid waste management among School students for achieving Swachh Hyderabad through formation of WOW clubs in 2000 schools under WELLBEING OUT WASTE (WOW) project, a joint initiative of GHMC - ITC and MARI - Reg. Ref: Letter no. nil dated.16.06.2017 of Sri. Sib Sankar Bandyopadhyay, Divisional Head, Human Resource, for ITC Limited, Paperboards & Specialty Papers Division, Secunderabad. While enclosing a copy of letter received vide reference read above, all the Regional Joint Director of School Education / District Educational Officers / Mandal Educational Officers in the State are requested to take necessary action in the matter immediately. 'Swachh Bharat', ITC joined hands with different state Governments and implementing WOW (Wellbeing Out of Waste) initiative to strengthen the efforts of the Governments and ULBs to accelerate sanitation progress mainly with focus on solid waste management. Well Being out of Waste (WOW) is a joint initiative of ITC under its CSR portfolio and GHMC towards achieving sustainable waste management which is an essential requisite for sanitation development. WOW- Wellbeing Out of Waste a CSR initiative of ITC Limited started in 2007 with a intent of educating people on Recycling of the waste to Protect Environment, Conserve Natural Resources, Inculcate the habit of Source segregation among the citizens, Recover the dry recyclable waste which is going in to landfill and make it available for recycling and lncentivize the Municipal workers. We are implementing WOW program in Hyderabad, Warangal, Siddipet, Sircilla, Vemulawada, Gajwel, Mahbubnagar, Sangareddy and Medak. We are also implementing at Bengaluru, Chennai, Coimbatore, Delhi, Muzzaffapur and AP, educated about million households, 5000 corporate offices, 10,000 Schools and colleges. We have recovered and recycled 35000 MT of dry waste like paper, plastic, metal, glass etc., from April 2016 to 3pt March 2017 thus contributing to Swachh Bharat. We are delighted to share that all the combined efforts of GHMC and ITC have resulted in Hyderabad being ranked as 1st among the metros and 22nd at all India level in the Swachh Sarvekshan 2017 carried out by the Ministry of Urban Development, GOI as part of Swachh Bharath Mission. Inspired with this progress, ITC is gearing up to further intensify its efforts to contribute to improve the sanitation standards of the Hyderabad city. In this context we would like to bring to your kind attention the proposed plan of action under WOW project to form WOW clubs in 2000 schools in GHMC jurisdiction and implement a variety of innovative activities to raise school children's awareness on waste management and further engage them as change agents for spreading the awareness among their parents, family members, servant maids and in the close by neighborhood areas. Children being the future citizenry of this nation, their awareness and motivation are pivotal for achieving Swachh Bharat and SWACHH HYDERABAD. f. Annual Event on sustainable waste management (exhibition stalls, workshops, film shows etc). g. Inter school Recycling Championship 2017-18.
b. School level waste to note books and stationery exchange programs to inculcate the habit of sustainable solid waste management among children. Children would be provided new stationery against the value of used / waste paper (note books, bits and pieces of paper) and dry waste. For implementation of the above activities we request your support for according necessary permission and instructions to the concerned DEOs and schools. Also please provide us the soft copy of list of schools (Government, Aided, Private and all other schools) under your jurisdiction in GHMC limits and the state so that we can identify the potential schools for implementing above activities. For further follow upon this subject Mr.S.N.Umakanth, senior manager, ITC WOW will be in contact with your office.